From Cabins to Lakeside Estates, our landscapes blend with our area's pristine countrysides. Escape from the bustle in the City to reconnect with the people that matter most. Caring for your dream property has never been easier. We offer custom built programs to serve both your budget and desires. Working with the native landscape, we develop functionality and enhance beauty. 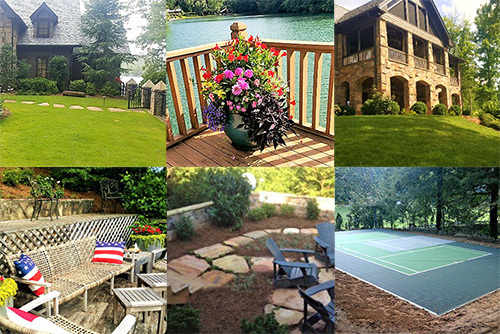 Our goal is to provide you with a beautiful lawn while implementing an environmentally conscious approach. Seasonal Color is an effective way to increase the aesthetic value and positive attention to your home. "I have been gone a lot these last couple of days, but I was so thrilled to come home to this gorgeous yard! Jim and I had so much fun walking around last night when I came in. The plantings are just beautiful; your men have been wonderful. This has been an absolute joy to do with Rustic Countrysides. Thank you so much for all you have accomplished here - we look so forward to working together in the future." - Jim & Dee M.